RIGHT SIDE PATRIOTS...For those who missed last night's show (or just want to listen in again) where Craig and Diane discussed 'A Laundry List to Nowhere'; 'The Sorry State of the 4th Estate...Part 1'; and important news of the day...you can listen to it (and previous shows) anytime at your convenience on our PodBean hosting/archive site. Click here: https://rightsidepatriots.podbean.com to go directly to our Podcasts and hope you become 'followers' of RIGHT SIDE PATRIOTS. 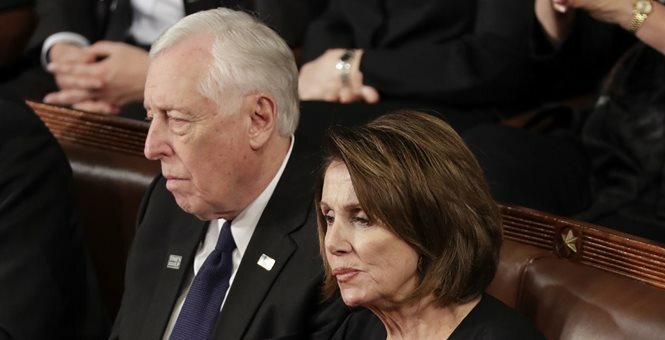 House Majority Leader Steny Hoyer (D-MD) broke with House Speaker Nancy Pelosi (D-CA) Tuesday telling Fox’s Neil Cavuto “sure” when asked if he was open to having President Trump give his State of the Union address in person on the floor of the U.S. House of Representatives. Cavuto followed up by asking Hoyer if he thought Pelosi would also allow Trump to give the address on the House floor Jan. 29, given that she suggested he postpone the address or deliver it in writing. “I don’t know what the discussions have been, so I don’t want to say,” Hoyer replied. Hoyer did point out that the State of the Union address is approved by a resolution from both chambers of Congress. "The president comes here at the invitation of the Congress, and particularly the House, to address the Congress of the United States," he emphasized.